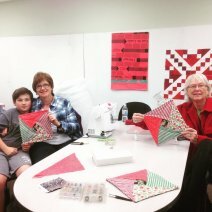 A great way to get a jump-start on Christmas Projects! All patterns and classes are free, but you must register for the classes on-line, stopping by, or by phone. If you need to use one of the shop's machines, please let me know to reserve. If bringing own supplies, a Materials List is on the website and also in the shop.